Let’s go on a trip down memory lane to before you got married. Maybe you were in college like me and my wife. Maybe you met while in high school or even before that like some couples I know. Think about that first time you saw your future mate. How did you act? Where you all suave and debonair? Maybe you were shy and coy. Think about those days. Think about the fun that you had together; how much you laughed together and actually did crazy things together. You might have gone on long walks around the campus or picnics in near by parks. Climbed trees together and took a lot of pictures. Maybe you enjoyed going to nice restaurants and getting dressed up. You might have even brought flowers from time to time. What happened to those days? I know, life happens. It’s kind of like that old children’s rhyme we used to say on the playground when two people liked each other: “K-I-S-S-I-N-G First comes love, then comes marriage, then comes Susie with a baby carriage.” Jobs, bills, children, and the daily routine (or rut) of everyday life. How can you break that rut in your marriage? Can you bring a sense of romance back into your lives? What about just having fun together? Many of the renown Christian Marriage Counselors suggest having a date night every week. I know from my own experience that can be somewhat prohibitive because of finances and baby sitting requirements. But the suggestion is a very good one. It helps both of you to know that your relationship is a priority in your lives. The same counselors encourage you to take a weekend off together several times a year. Again, I understand the money constraints and the kids but setting time and money aside for such events will strengthen you relationship greatly. Do you need a time together? Here are some benefits of setting aside a night or day just for you as a couple. You get away from it all. Sometimes you need to be reminded that you are a couple and not just bread winners and parents. Or house keepers, taxi drivers, etc. You need time to be friends and lovers. You need time to relax and enjoy yourselves. You can reconnect. During your date, you will want to talk about things that are enjoyable and fun. You don’t need to talk about the problems. What brought you together to start with? What attracted you to each other? What do you have in common, besides the bills and kids? You can be crazy. Many jobs do not allow you to relax and they can be very stressful. Take you spouse to a place that crazy is acceptable. Be playful and release those tensions. You can go places that are not that kid friendly. No, I’m not talking about anything ugly or dirty. I’m talking about going to a nice sit down restaurant and not just McDonald’s or Chucky Cheese’s or other places that love kids and have playgrounds, etc. Sometimes you or your spouse will want to get dressed up and have someone else to serve you. You will want food that comes on a nice plate with real silverware and cloth napkins instead of paper wrappers and paper napkins. It can be fun and relaxing not to have to worry your little people for an evening. These are just a few benefits. I’m sure you can think of many more. The most important idea about date night and get away weekends is to be together. You begin to focus more and more on each other and the routine doesn’t seem so unbearable. 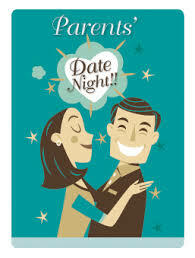 What benefits have you found in having a date night? Leave your comments in the section below.